Silken tofu gives this smoothie an excellent dose of vegetarian protein and a thick, creamy texture. It’s a perfect non-dairy option for people dealing with lactose-intolerance. 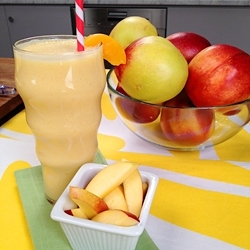 Combine all ingredients in a blender, and blend until smooth and frothy. * Feel free to substitute a cup of frozen peach slices, frozen cherries, or a sliced banana. For an extra twist, add 1⁄4 teaspoon of vanilla extract to the concoction.